This article is about the band. For the South African football club, see Kaizer Chiefs F.C. Their UK hit singles include 2004 and 2005 number 9 hit "I Predict a Riot", 2007 UK number 1 hit "Ruby", which has sold over 461,000 copies, from their platinum album Yours Truly, Angry Mob plus a further two Top 20 singles in 2007 with "The Angry Mob" and "Everything Is Average Nowadays". In 2008, they had a UK number 5 hit with the post-punk revival track "Never Miss a Beat". Their 5 singles "Ruby", "I Predict a Riot", "Everyday I Love You Less and Less", "Never Miss a Beat" and "Oh My God" had sold a combined total of 1.1 million up to August 2012. Their latest top 40 single, "Coming Home" hit number 31 in 2014. Their album Education, Education, Education & War hit number one in the albums chart also in 2014. Kaiser Chiefs' second album Yours Truly, Angry Mob was released in February 2007. The group recorded the album throughout the September and October 2006 at Hookend Recording Studios in Oxfordshire, England. The group took inspiration from Led Zeppelin and American rock music, and recorded over twenty-two songs. The stage at Elland Road stadium on 24 May 2008. Ricky Wilson in concert in Germany in 2013. Education, Education, Education & War was toured across Europe and the Americas throughout 2014 and 2015. In 2015, they supported the Foo Fighters during the South Africa, South America and Ireland legs of their Sonic Highways World Tour. They also released stand alone single 'Falling Awake' on 27 January 2015 via their YouTube channel. Stay Together, the band's sixth studio album, was released on 7 October 2016. It was co-written and produced by Brian Higgins, whose production company Xenomania has worked with the likes of Girls Aloud and Pet Shop Boys. The album's name is a reference to the song "We Stay Together". The first single from the album, "Parachute", was released on 14 June 2016. The second single, "Hole In My Soul" was released 18 August 2016 and the third and final single, "We Stay Together" was released on 9 December 2016. The band performed a string of best of forest shows in the summer of 2016 as part the Forestry Commission's Forest Live series. Stay Together was toured across Europe in early 2017. As of April 2018, the band are currently recording their seventh studio album which is due for release in early 2019. The band signed with their original label Polydor Records for their seventh studio album, codenamed #KC7. They've also reunited with Ben H. Allen, the producer who worked on the band's 2014 album Education, Education, Education & War. The band will support the record with over 20 live dates in January and February, including concerts at London's O2 Academy Brixton and O2 Academy Birmingham. The band were the closing act for F1 Live (an event showcasing Formula 1 ahead of the 2017 British Grand Prix) held in Trafalgar Square, London on 12 July 2017, which was also broadcast live on Sky Sports. ^ "The Greatest Indie Anthems Ever – countdown continues". NME.COM. Archived from the original on 15 November 2014. Retrieved 27 September 2014. ^ Q Magazine. "Q Awards 2007". Kaiser Chiefs Best Video. IPC. Archived from the original on 10 August 2011. Retrieved 15 June 2011. ^ "Kaiser Chiefs - Press". Web.archive.org. 13 October 2007. Retrieved 15 January 2019. ^ Click Music News. "Kaiser Chiefs add second London date". 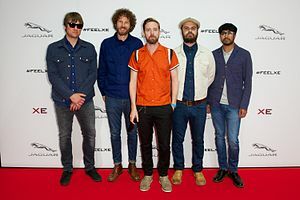 Click Music News- Kaiser Chiefs add second London date. Archived from the original on 17 August 2011. Retrieved 15 June 2011. ^ "Kaiser Chiefs support Alzheimer's Society with the launch of their new album". Kaiser Chiefs support Alzheimer's Society with the launch of their new album. Alzheimer's Society. Archived from the original on 19 September 2011. Retrieved 15 June 2011. ^ "Kaiser Chiefs New". Kaiser Chiefs Band News. Kaiser Chiefs.com. Archived from the original on 6 June 2011. Retrieved 15 June 2011. ^ "Band statement on Nick's departure | News". Kaiser Chiefs. Archived from the original on 7 December 2012. Retrieved 13 December 2012. ^ Radiox.co.uk. "LISTEN: KAISER CHIEFS UNVEIL PARACHUTE SINGLE | Radiox.co.uk/". Radiox.co.uk. Retrieved 13 June 2016. ^ NME.COM. "Kaiser Chiefs working on new album of love songs | NME.COM". NME.COM. Retrieved 7 May 2016. ^ Aroesti, Rachel (6 October 2016). "Kaiser Chiefs: Stay Together review – nondescript but still full of hooks". The Guardian. Retrieved 17 May 2017. ^ Trefor, Cai. "Kaiser Chiefs' Ricky Wilson Opens Up About New Album Stay Together". Gigwise. Archived from the original on 14 October 2016. Retrieved 13 October 2016. ^ "R.E.M, Kaiser Chiefs, C:Real & Gabriella Cilmi". MTVGreece.gr. Archived from the original on 21 July 2011. Retrieved 21 July 2011. ^ "Kaiser Chiefs Live At The Hull Adelphi". Codhead.co.uk. Archived from the original on 7 March 2016. Retrieved 16 February 2016. ^ Murray, Robin. "Kaiser Chiefs Announce New Album". Clash. Retrieved 11 November 2018.